On Friday, April 6, Queen's hosted a live video broadcast Q&A with NASA Astronaut Drew Feustel from the International Space Station. That’s certainly what Dr. Feustel has done. The proud Queen’s graduate (at one point during the NASA press briefing on March 1, he pulled open his blue astronaut jumpsuit to reveal a Queen’s T-shirt underneath) had wanted to become an astronaut since childhood. Now a veteran of two flights into space, he will spend a total of 5 ½ months aboard the International Space Station in 2018, including three as the station’s commander. Growing up in Lake Orion, a suburb of Detroit, Michigan, Dr. Feustel was fascinated with space exploration, inspired in part by television shows like The Jetsons and Lost in Space. “I thought by the time I grew up everybody would have regular access to space,” he says, adding ruefully that we are still closer to the world of Fred Flintstone than that of George Jetson. EVA: Extravehicular activity or spacewalk. Astronauts carry out EVAs on the ISS to make repairs or set up experiments outside the station. On an EVA, astronauts are positioned by the Canadarm2. International Space Station: Launched into space in November 1998 and measuring more than 72 metres in length and about 108 meters across, the ISS is the largest object in low Earth orbit and is visible to the naked eye. Johnson Space Center: Properly the Lyndon B. Johnson Space Center, this sprawling Houston-based complex (it covers more than 1600 acres) is the headquarters for NASA’s human spaceflight training and research. Mission control here directs the activities aboard the International Space Station. Soyuz: First developed as part of the Soviet space program in the 1960s and improved upon continuously ever since, the Soyuz is a three-person spacecraft that, since the last flight of the Space Shuttle in 2011, has provided the only means of reaching the ISS. The capsule is boosted into space aboard the Soyuz rocket, regarded as the world’s most reliable. He arrived at Queen’s in 1991, drawn north in part because his wife, Indira, whom he had met at Purdue while she was doing a graduate degree in speech pathology, was from Eastern Ontario, and wanted to return to Canada. Queen’s also presented the chance to work with Professor Chris Young and be a part of his Engineering Seismology Laboratory. “It was really something I was interested in,” says Dr. Feustel. “Installing seismic monitoring systems in mines, to understand the stresses and strains on them as the minerals were extracted.” The work allowed him to combine his theoretical interest in geophysics with his natural mechanic’s bent. “It took a lot of hands-on skills in the field,” he says. “We spent a lot of time down mines making sure that all the systems were working.” Only Queen’s, he says, could give him that unique blend of experience. He was awarded a PhD in geological sciences, with a specialization in seismology in 1995. Dr. Feustel worked for a time with Kingston’s Engineering Seismology Group, a spinoff from his old lab, before ultimately heading south to take a job with ExxonMobil in Houston, Texas – home of the American space program. At a conference there in 1997, he met a Canadian geophysicist named Rob Stewart. Although he had never gone into space, Dr. Stewart had been part of the Canadian astronaut program in the early ’90s. Dr. Feustel remembered seeing the geophysicist on a Canadian TV show years earlier. Learning about Dr. Feustel’s desire to become an astronaut, Dr. Stewart suggested he try calling Chris Hadfield to learn more about the space program. Dr. Feustel found the number for the Johnson Space Center in the phone book, cold-called and was ultimately put through to Hadfield. The two became friends, bonding, he says “over music and water-skiing.” He applied to the space program in 1999 and was accepted in 2000. On his first mission, STS-125, in 2009, Dr. Feustel spent 11 days in space aboard the shuttle Atlantis, on the last-ever mission to service the Hubble telescope. In 2011, as part of the crew of the shuttle Endeavour (STS-134), he spent 16 days in space, carrying supplies to the International Space Station and performing repairs that required him to take four separate EVAs (or extravehicular activities as spacewalks are known). This was the penultimate flight of the Space Shuttle program. During his time with NASA, Drew Feustel became a Canadian citizen – making him the next Canadian in space. He and his family return frequently to Canada and to Queen’s, where Dr. Feustel was awarded an honorary degree in 2016 as part the university’s 175th anniversary celebrations. The International Space Station is a scientific laboratory. Thousands of research experiments have been conducted among the stars, with each new mission expanding our understanding of the world – and beyond. During his months in space, Dr. Feustel will be part of two separate missions, Expeditions 55 and 56, carried out back-to-back. For the first, he will serve as a flight engineer; for the second half of his time aboard, after Artemtyev and NASA astronaut Richard R. Arnold have left the ISS and been replaced by American Serena M. Auñón-Chancellor, German Alexander Gerst, and Russian Sergey Prokopyev, he’ll serve as the station’s commander. “My job during the next five months is to really care for the space station and all the research projects,” says Dr. Feustel. As astronauts, “our job is to ensure that the space station continues to function and to support the science and research that’s being carried out.” That means looking after the systems that keep the lights and the heat on and the air flowing, and carrying out repairs, both inside and outside the station, as needed. Dr. Feustel and his fellow crew members oversee the scientific equipment onboard the space station and perform “literally hundreds of experiments over the course of time we are there”, generally focused on earth sciences, human and health sciences and innovative technology. “We are the hands, eyes, and ears of the people who designed those experiments,” he says. A key part of an astronaut’s role is to serve as the human face for the space program and the science carried out on the International Space Station. It’s a role Drew Feustel excels at, responding enthusiastically on this early March morning via video link to an endless succession of fairly similar questions from journalists. As part of this outreach, he is participating in a Year of Education on Station, a NASA program that engages astronauts as educators and takes advantage of the unique capability of the ISS to stimulate the interest of students from kindergarteners to post-graduates. Phoning home: Drew stays in touch with his family through a voice-over IP phone, emails and weekly video chats. Art and science: Playing guitar and fronting vocals, Drew is a member of the all-astronaut band Max Q. With a few Tragically Hip songs as part of its repertoire, the band takes its name from an engineering term for the maximum dynamic pressure from the atmosphere experienced by an ascending spacecraft … or Queen’s. You decide! 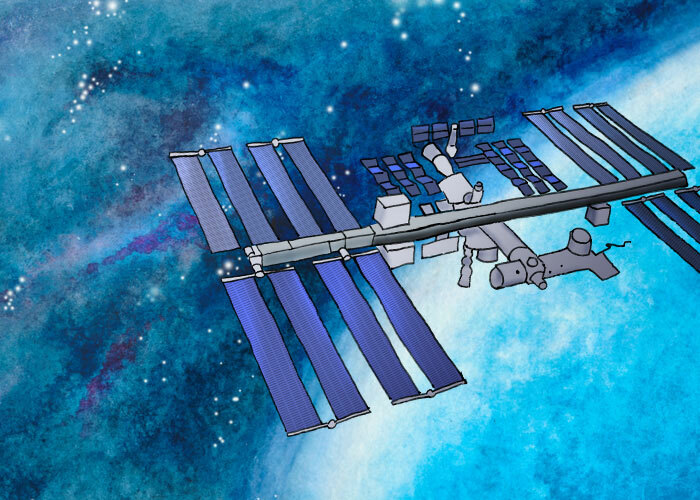 Did you know: The ISS is the third brightest object in the sky? It’s so bright, it can be spotted with the naked eye as it travels around the Earth. Find out when Drew will be flying overhead on NASA’s ‘Spot the Station’ site.